Jupiter's Folly. Explore, Expand, Exploit, Exterminate! Tips for your first game! The object of the game is to harvest crystal from the planet surface as fast as you can. The first player to mine their quota of crystal is the winner. To gather crystal you must build mines to extract it from the surrounding rock. Each mine you build will automatically collect crystal and store it in large piles on the planet surface. The higher the concentration of crystal in an area, the faster your mine will extract it. Build your mines in areas where there is lots of crystal. There can only be one winner in a game of Jupiter's Folly, and making and breaking alliances with the other players is an important part of the game. Trade with the other players to improve your position. Keep a close eye on the leader board and make sure no one player gets too far ahead. The leaderboard, don't let anybody get to far ahead. Jupiter's Folly is a slow real-time strategy game. Throughout the day, your mines will automatically work to produce crystal and your security teams will travel from place to place carrying out your orders. Your forces will automatically fight enemies they meet and capture enemy mines they visit. You'll get a report of all the things that occur while you are away. 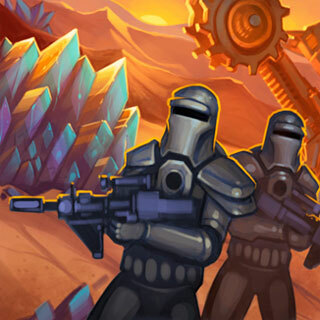 Check back throughout the day to watch the progress of your forces as they slowly march from place to place, expanding your mining empire and waging war on the other players. A short game might last a week or so, an epic game might last months. When creating a game of your own you can customize the size of the map and the amount of crystal that must be collected. In single player games you may jump forward 4 hours at a time whenever you are ready. This allows you to play a whole game in just a few hours. A single player game. Jump ahead in time! In this example, Blue will roll 2 dice and add the result to its strength of 44. Red will roll 1 die and add 24. If Blue were to roll a 3 and a 4 it would have a total score of 51. If Red were to roll a 6 it would score 30. Blue would win and Red would be destroyed. Blue would suffer casualties of 24 (Red's strength) minus Blue's die roll of 7 which equals 17. Blues strength after the combat would be 27. A combat is automatically fought when two enemies meet on a road or at a map location. You will receive a log describing the result of the combat the next time you login. Every army in the game has an experience Level and a Strength which determines how well it fights. Opposing forces roll a number of dice equal to its Level, and adds these to its Strength. The army with the largest total wins and the loser is destroyed. The winner suffers the losers strength in casualties. Some casualties are prevented by the roll of the winners dice, so the higher an army's level, the less casualties they will receive. The winners strength is reduced by the number of casualties suffered. An army earns an experience point for each point of damage it inflicts. When enough experience points are earned an army will level up and will roll more dice in future combats. When more than one army is camped at the same location, the largest army will fight first. Then all smaller armies will fight in turn until only one faction of units remain. 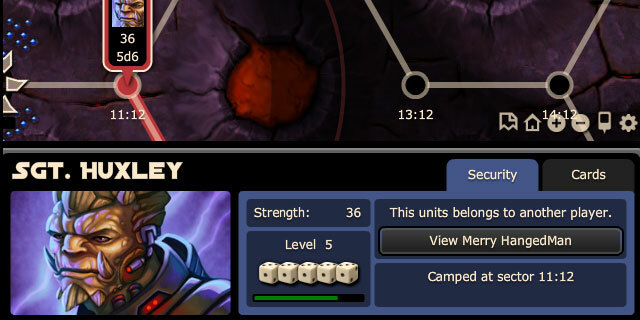 Sgt Huxly is nearly Level 6 and will soon roll 6 dice! Each player in Jupiter's Folly holds a hand of cards which determines what they can and can't do. You can look at the hand of each player at any time to see what they can do. There is a card for every action you can do in the game. To know what you can do at any time, all you need to do is look at your cards. Jay's Character Sheet showing his cards. Most cards are returned to you hand when you play them, and as time progresses you will add new cards to you hand. As your hand grows you will be able to do more things. Some cards can't be used by the player who owns them. Instead they must be lent to the other players. 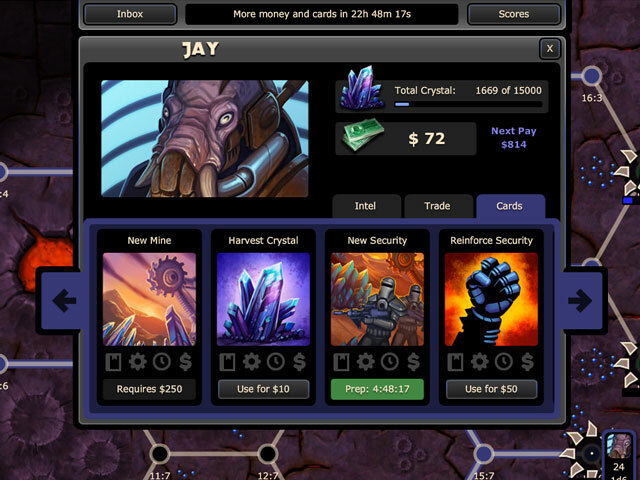 Look for cards you need in the hands of the other players and negotiate to borrow them. Any cards lent to the other players are automatically returned to you 24h after you send them. You can then lend them to a different player, or renegotiate the terms of your trade. 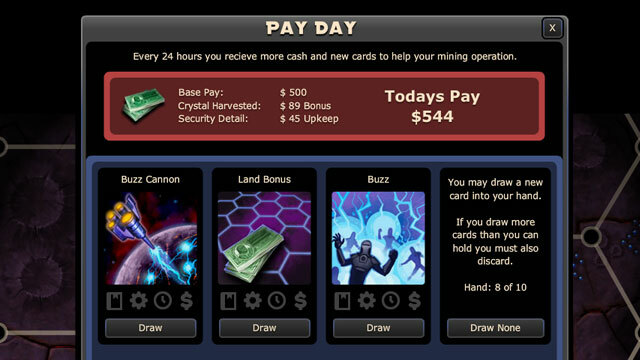 Once a day, you receive more money and new cards to help grow your mining empire. You will receive $500 every 24 hours, plus $1 for each crystal you have Harvested since you last collected your income. Each of your security details needs to be paid from this income. Each unit you have requires $5 a day. In addition to money you will receive new cards. You will be presented with several options and asked to choose between them. Some card will be for you to play yourself, other will be for you to trade with the other players. Consider your choice carefully as the cards in your hand are what sets you apart from the other players. Fierce storms and volcanic activity make it almost impossible to communicate with ground teams while the are on the move. 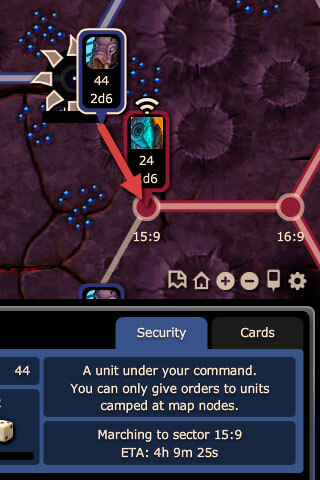 In fact, you can only issue orders to your units when they are camped at a map node. Look for an icon above a unit indicating it is in radio contact. 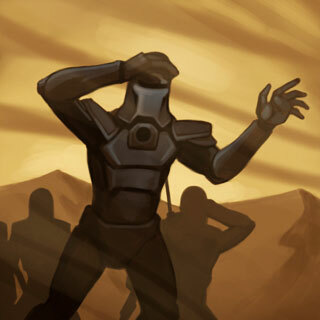 Many cards require your units to be in radio communication before they can be the target of cards. In this example, Blue is on the march and cannot be given new orders. 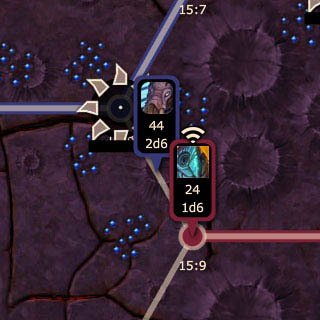 Red is camped at a map node and can be given new orders or reinforced. To make life more dificult, planets rich in crystal are also teaming with alien life forms. 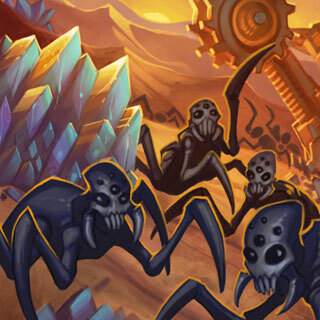 Your security teams will need to keep the alien bugs away from your mines. Aliens that come in contact with your mine will damage it. You'll need to repair it before it will gather any more crystal. 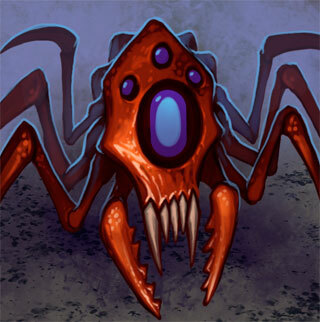 Deep underground alien queens build nests and spawn new bugs. With every new bug spawned the queen gain a level of experience. 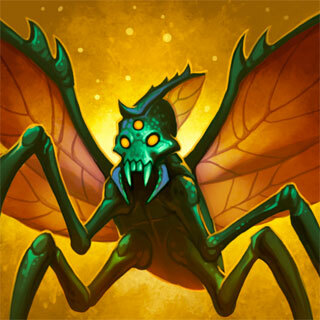 At the begining of a game a nest will spawn level 1 bugs, but it wont be long before the queen levels up and more powerful enemies are spawned. This queen is already spawning Level 4 Swarms. The first thing you should do each time you login is check your Inbox. It provides a summary of all the events that have taken place while you were away, the battles your units have fought and the cards that have been played. You might also receive diplomatic messages from other players who need help defending their operation or needing to trade cards. 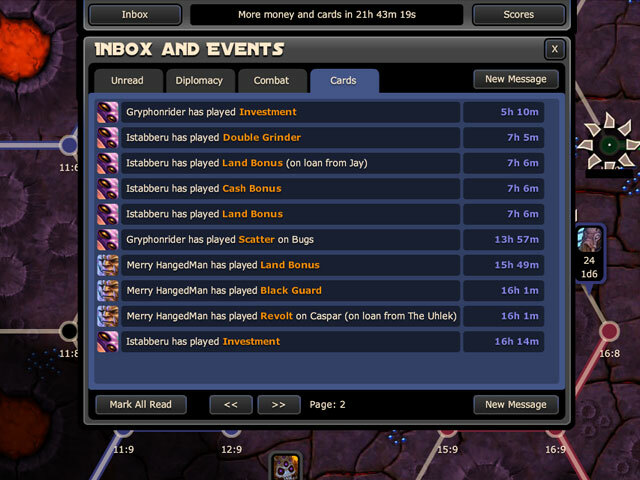 The Inbox showing cards recently played. For $100 You can request peace of one of your opponents. If they accept your offer of peace you will be able to see what they see and move through their territory without capturing their locations or fighting their security details. Similarly, they will see all that you can see, and move through your territory. Be careful who you make peace with as your allies can declare war on you again at any moment with no notice. If they have forces in your territory combats will take place immediately. 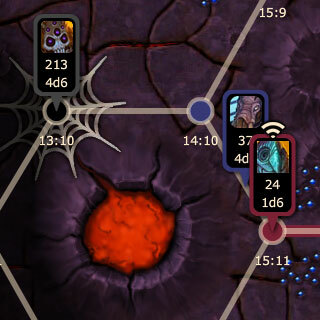 Also note that your allies will be able to see where your troops are moving and where your mines are deployed. You must ask yourself if you trust them not to share this information with your enemies. You should also pay careful attention to who your allies are trading their cards with. You might be sending good cards to them, make sure they are not sending their good cards to your enemys. There are no perfect opening moves in Jupiter's Folly, everybody uses a different strategy. The best thing to do is just jump in and see what happens. Don't be afraid to click around and explore. Below is a list of things you should try on your very first day. Read about the cards you have in your hand, get a feel for what is cheap and whats expensive. Have a look at the cards that the other players have too! Reinforce one your security teams. Perhaps order a new one if there are a lot of Aliens around. 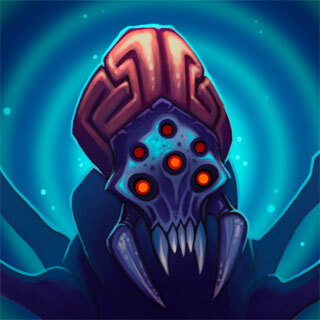 Find an Alien horde and move a security detail to intercept it. Keep in mind the Aliens move randomly from place to place and you must be stronger than them to defeat them. Look at the cards the other players have to trade. Think about whether or not you could make use of them and send them a diplomatic message asking to borrow it. Log back in later in the day to see how far your armies have moved or chat to the other players! Remember, there can only be one winner in a game on Jupiter's Folly. Keep and eye on the leader board and make sure no player gets to far ahead.